In the Windows environment, service processes are started automatically when the PC is started, so that it is not necessary for a user to logon to the computer to run a service program. 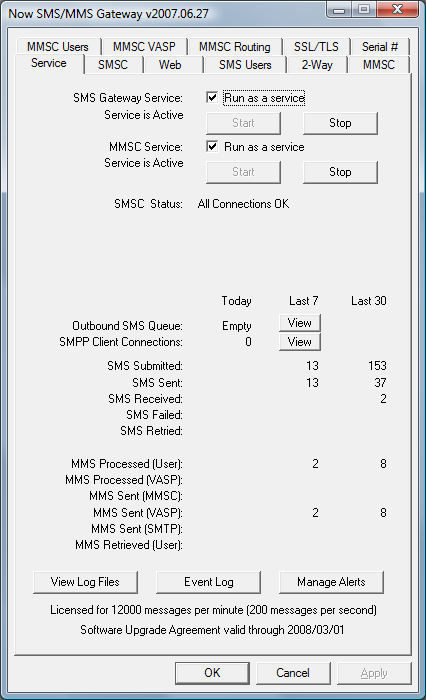 The Now SMS & MMS gateway operates as a Windows service. Select “Yes” to install and activate the service, or “No” to exit without activating the service. The “Service” configuration dialog can also be utilized to install or remove the gateway services. NowSMS installs as two separate services, for historical reasons. Most installations will want to have both services installed, even if they are only making use of only SMS or MMS related functionality. In order to function properly, the “SMS Gateway Service” requires that an available unique TCP/IP port number be assigned to the NowSMS web interface. This port number is defined in the “Port number for web interface” setting on the “Web” configuration dialog. For more information, see Configuring the Web Interface. In order to function properly, the “MMSC Service” requires that an available unique TCP/IP port number be assigned to the HTTP interface of the MMSC. This port number is defined in the “HTTP Port Number” setting on the “MMSC” configuration dialog. For more information, see MMSC Messaging Server.